Potter County Conservation District (PCCD) was honored this week in Harrisburg with the coveted 2018 Governor’s Award for Environmental Excellence. It’s based on a project titled, “Water Quality Protection and Education: Ludington Run and Beyond.” The district developed a comprehensive plan to improve water quality and restore habitat on Ludington Run, a tributary of the Genesee River. Stream bedding materials are enhancing successful fish spawning; runoff carrying sediment and pollutants is discharging in a safe manner, and stream plantings are stabilizing the soil and reversing the trend of thermal pollution. 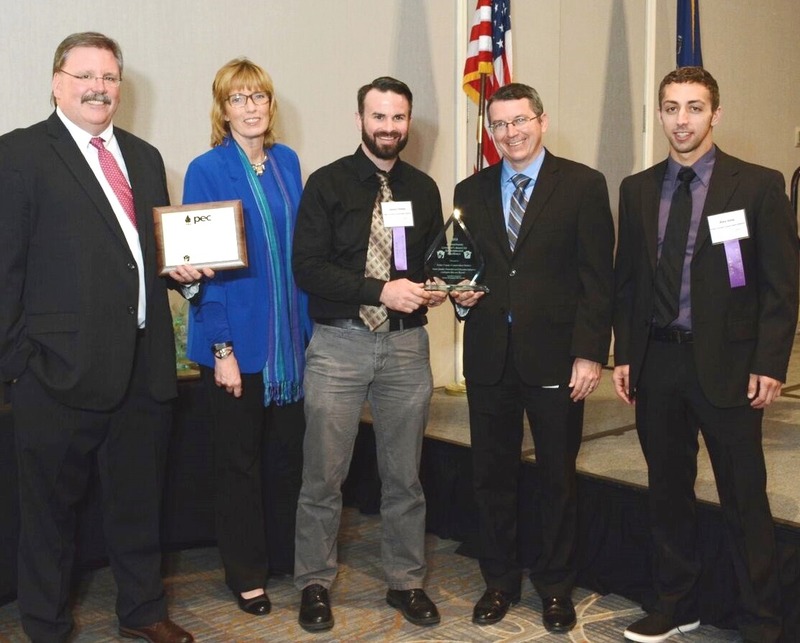 PCCD Manager Jason Childs and Alexander Veto, the agency’s dirt/gravel/low-volume roads project specialist, received the award on the district’s behalf. Because this work took place in the headwaters region, its benefits will impact countless people both in Potter County and downstream. Having met or exceeded all expectations, the Ludington Run Pilot Project is now a documented best practice that will be used as a model in other areas of Potter County and publicized statewide and nationally. Potter was the first Pennsylvania county to establish a conservation district, dedicated to establishing innovative conservation practices with leadership, hands-on assistance and education. That mission continues today. The district’s goal to foster stewardship of natural resources by inspiring current and future generations to preserve the legacy of conservation. The district prides itself on being a grassroots, boots-on-the-ground organization with dedicated specialists who work with the farming community, environmental interests, government entities and agencies, as well as the general public, to support stewardship of natural resources. Potter County also received the 2012 Governor’s Award for Environmental Excellence for formation and successful deployment of the Triple Divide Watershed Coalition, committing all of the public water suppliers in the county to protection of the wells, springs and surface sources of public drinking water. (Shown at the ceremony (from left) are: Pennsylvania Environmental Council president Davitt Woodwell; Pa. DCNR Secretary Cindy Dunn; Jason Childs, manager of Potter County Conservation District; Pa. DEP Secretary Patrick McDonnell; and Alex Veto, dirt/gravel/low-volume roads specialist with Potter County Conservation District). Results from a historic analysis of the groundwater in Potter County were shared with the public last week. With just one exception, the water quality was found to be pristine. 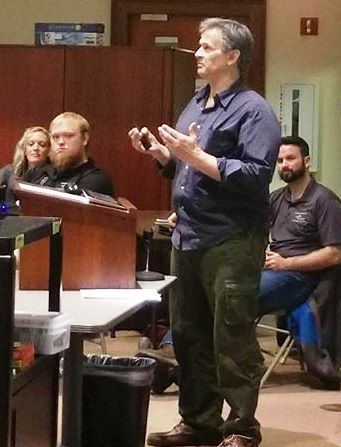 Dan Galeone (standing), hydrologist with the U.S. Geological Survey (USGS), detailed the findings to nearly two dozen people attending the public meeting at the Gunzburger Building. A detailed report will soon available on the county website, pottercountypa.net (click on Planning Department). USGS partnered with the Potter County Board of Commissioners to collect data on the quality and constituents of the county’s groundwater. The information will be invaluable for public policy-makers, industries, regulatory agencies and others seeking to protect water when sites are chosen for certain types of development. A state grant covered the bulk of expenses. Some 47 water wells in strategic locations were sampled. One of the wells, located in Stewardson Township, showed a high content of a radioactive element, which Galeone said was attributable to geological factors, rather than pollution. Data was assembled and analyzed cumulatively, with the identity of individual well owners protected. Confidential findings from the analysis were provided to each owner. Similar studies have been completed in Clinton, Bradford and Lycoming counties. Plans are being made to extend the regional groundwater assessment to Tioga, McKean and Elk counties. Also at last week’s meeting, Heather McKean, Penn State Extension water resources educator, discussed steps that well owners can take to protect water quality, More information on the USGS study is available from Dan Galeone (USGS) at 717-730-6952, or Potter County Planning Director Will Hunt at 814-274-8290, extension 229.